RG Herald: Diaz Sworn in to RGCCISD Police Dept. Diaz Sworn in to RGCCISD Police Dept. 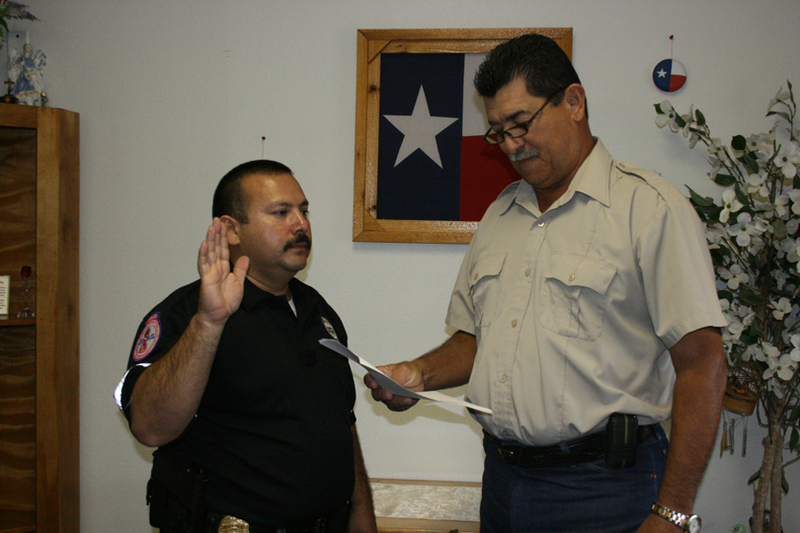 Officer Jesus Diaz was sworn in as an RGCCISD Police Officer on September 8, 2010 by School Police Chief Hernan Garza. Diaz attended the Police Academy and graduated as one of the top students in his class on March 2009. Officer Diaz worked as a Peace Officer in Sullivan City briefly before joining the district's Police Department. He had previously been employed as a bus driver for Rio Grande City CISD for the past 13 years. His experience with school policy and demographics will undoubtedly aid him in his new career. Officer Diaz is married to Anna Lee and they are the parents of four (4) children; Emily Ann (20 yrs. ), Jesus Diaz, Jr (18yrs. ), Jessica Lean (10 yrs. ), Jackie Diaz (7yrs.) and the proud grandparents of an 11 month old Dilan Rodriguez. Pictured are Diaz and Chief Garza. (RGCCISD Photo).